Five years after Hurricane Katrina devastated New Orleans and the Gulf Coast, a majority of Americans (57%) say that the nation is no better prepared for hurricanes and other natural disasters than it was in 2005. 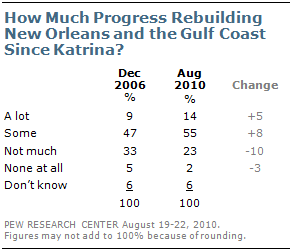 However, the public does see progress in rebuilding New Orleans and the Gulf region: 69% say there has been a lot or some progress made rebuilding New Orleans and the Gulf, up from 56% in 2006. The national survey by the Pew Research Center for the People & the Press, conducted Aug. 19-22 among 1,003 adults, finds that midway through the 2010 hurricane season, there is broad skepticism about the nation’s preparedness to deal with hurricanes and other natural disasters. 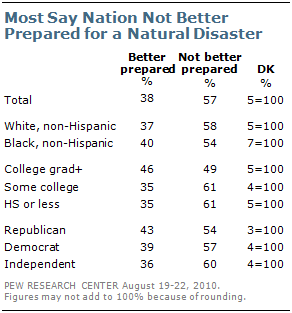 Majorities of most political and demographic groups — including 57% of Democrats and 54% of Republicans — say the nation is not better prepared for such disasters than it was when Katrina devastated the Gulf Coast. College graduates are an exception; those with college degrees are about equally likely to say the country is better prepared (46%) as to say it is not better prepared (49%). By contrast, just 35% of those who have not graduated from college say the country is better prepared, while 61% say it is not. Nearly seven-in-ten say a lot (14%) or some (55%) progress has been made over the past five years rebuilding New Orleans and the Gulf Coast following the damage from Hurricane Katrina and its aftermath. This is significantly more than said progress had been made in December 2006. Nearly a quarter of Americans say not much (23%) or no (2%) progress has been made. Across groups, substantial majorities say that a lot or some progress has been made rebuilding following the disaster. However, Democrats are somewhat less positive in their evaluations of progress compared to Republicans and independents; 63% of Democrats say a lot or some progress has been made, while 75% of Republicans and 74% of independents say this. College graduates are somewhat more likely than those without college degrees to say progress has been made (75% vs. 67%). Those living in the South — which includes the Gulf Coast-are more likely than others to say progress has been made. Three-quarters of Southerners (75%) say at least some progress has been made, compared with two-thirds (66%) of those in other regions. And Southerners are about twice as likely as others to say there has been a lot of progress rebuilding New Orleans and the Gulf Coast (21% vs. 11%). View the topline and survey methodology at people-press.org.